Question: How do I add a firm service contact to a case? The Service Contacts page (Figure 1, A) is the third page of the FileTime eFiling process. Any Firm Service Contacts already added by your firm to this case will be displayed in the Firm Service Contacts area (Figure 1, B). Anyone displayed here can be eServed by counsel when they eFile into this case. To add one of your firm members as a Firm Service Contact to this case, click the Add Service Contacts button (Figure 1, C). The Attach Firm Service Contacts to this Case window opens (Figure 2). By default, this window displays any Firm Service Contacts your firm Admin has already set up (Figure 2, A). 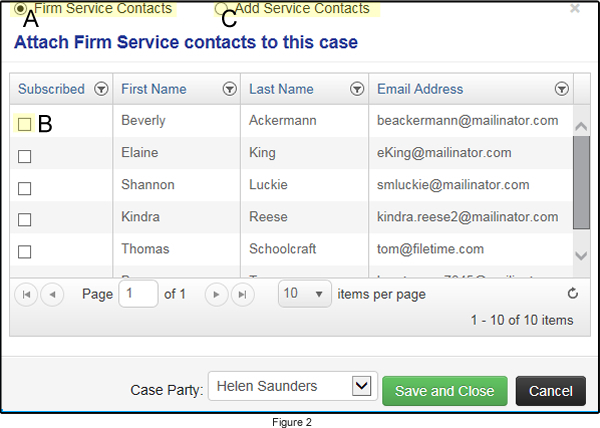 Click the check box next to name (Figure 2, B) to add that person as a service contact for the case. If the person you want to add is not displayed on this list, click the Add Service Contacts option (Figure 2, C). The Add Service Contact page opens(Figure 3). Enter the name and email address of the person. If desired, enter and email address in the Administrative Copy area (Figure 3, B) to which you want to have eFileTexas send an addition notification email when this person is eServed. For example, if you are adding an attorney as a service contact, you might want to add the email of his assistant so the assistant also receives a copy of any eService emails. If desired, click the Opt-in to accept eService option (Figure 3, C) to add this person to the eFileTexas Public Service Contact List. Use this method to add a firm service contact sometime other than during an eFiling submission. 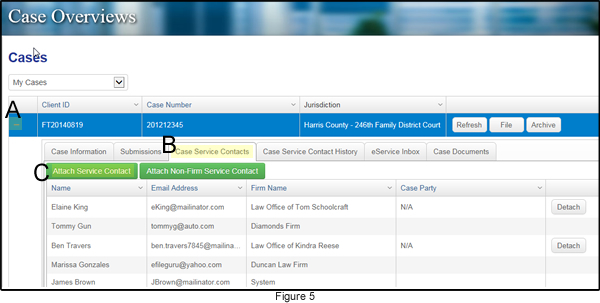 From either the Case Overviews or the Cases page (we're using the Case Overviews page in this example - Figure 4) find the case for which you want to add a firm service contact. When you locate the case, click the + sign in the far left column for that case (Figure 4, B). The case tabs open beneath that case (Figure 5). 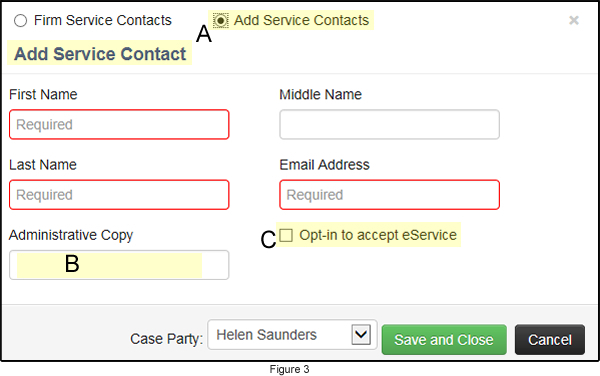 Click the Case Service Contacts tab (Figure 5, B). You now see all the case service contacts that eFileTexas has recorded for this case. Click the Attach Service Contact button (Figure 5, C). Follow the steps you see for Figures 2 and 3 above to select or add new firm service contacts for this case.